Printed photos have been around since 1827, and if you have boxes or albums full of them, sitting in storage, you might be tempted to either pay someone to digitize them or to forget them. 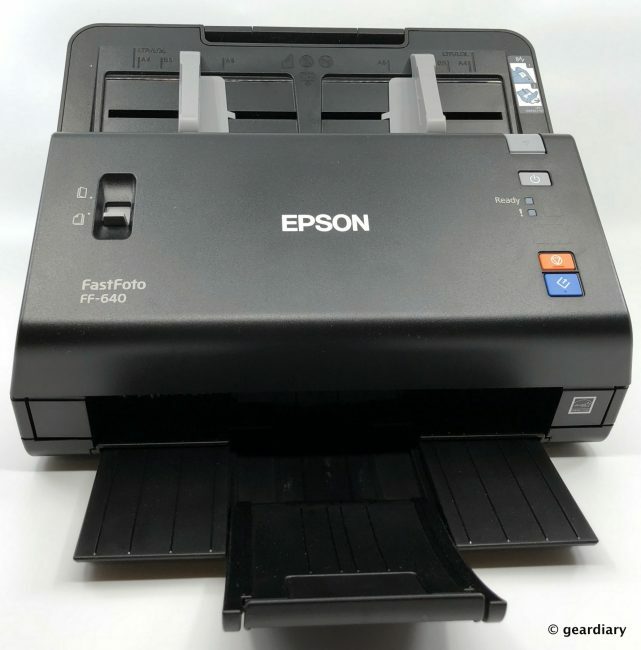 Another option is using the Epson FastFoto FF-640; it’s a high-speed photo scanning system perfect for digitizing, and that’s just the beginning of its usefulness. I think that anyone over the age of 25 probably has a substantial stash of physical photos that they’d prefer to have on their phone or computer. 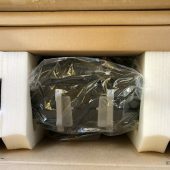 But the process of getting those pictures digitized can seem daunting when you are looking at stacks of photos and considering your options. 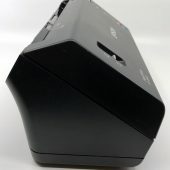 I’ve used LegacyBox in the past for converting VHS tapes, cassette tapes, slides, or reel to reel tapes to digital. But I’ve always stopped short of sending photos to them because LegacyBox is not cheap. To send in a box of 500 photos (just to pick an arbitrary number), you’d have to spend $559. 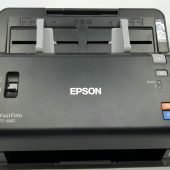 For $579.99, you can get the Epson FastFoto FF-640, which will allow you to scan all of those photos (and an infinite number more) yourself — quickly, safely, and without sending them off-site. This makes better fiscal sense if you’ve taken a lot or if you’ve inherited a lot of photos, as I have. 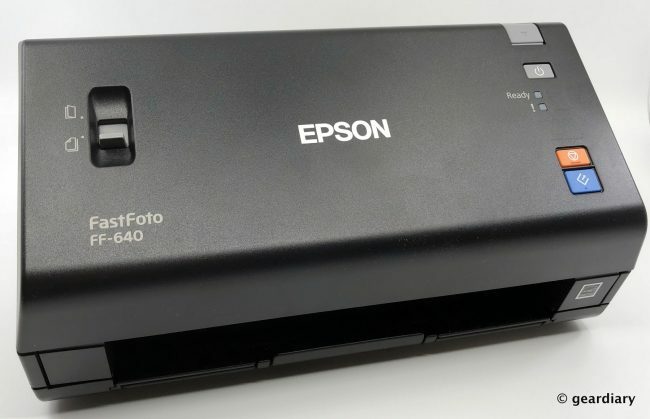 Other than laying them out and taking individual photos of each photo with my phone and then cropping them, I haven’t really hit on an efficient way to digitize them until now — with the Epson FastFoto FF-640. 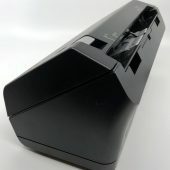 World’s Fastest Photo Scanner – scan thousands of photos as fast as 1 photo per second. High-quality scans up to 600 dpi – scan precious images, from wallets to panoramic photos. Preserve what’s priceless – Restore, Save, Organize and Share images. 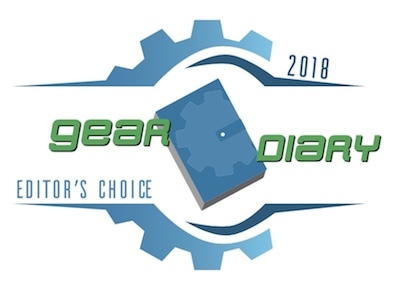 Ideal for life’s special events – easily create slideshows, displays and more for anniversaries, weddings and family reunions. 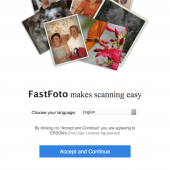 Custom FastFoto software – bring new life to old photos automatically with Smart Photo Fix (SPF) Technology, red-eye reduction and color enhancement features. 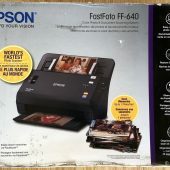 Included in the box are the FastFoto FF-640, a power cord, a printer to USB cable, two microfiber cloths, a plastic carrier sheet (for inserting fragile old photos into the scanner), and a quick-start guide. 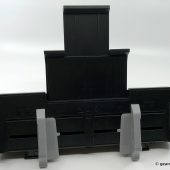 Before getting started, you’ll want to attach the hopper; it slides right into the top of the FastFoto. 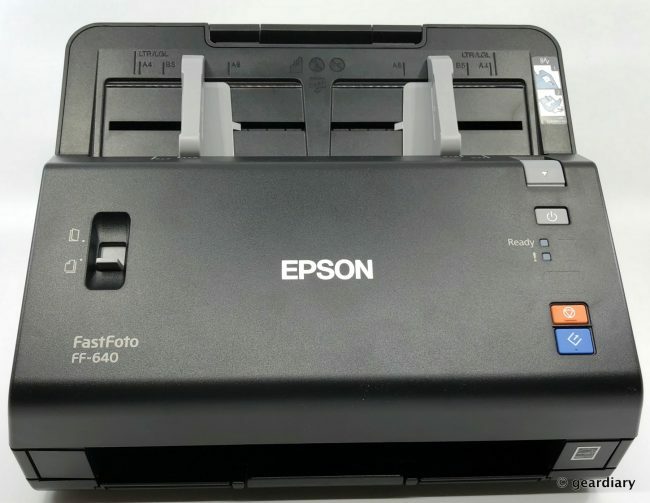 The main body of the Epson FastFoto FF-640 measures ~11″ wide by 8″ tall by 8″ deep; in other words, it’s much smaller than a printer but still big enough to handle an 8×10 photo or a regular sheet of paper. 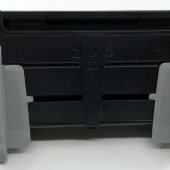 The front of the hopper has dual sliders to guide your photos through. Moving to the body of the scanner, there’s a page separation lever on the left side. 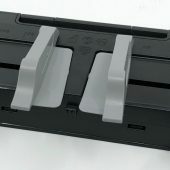 When the lever is up, you can scan plastic cards, folded documents, envelopes, or any document or photo that requires a carrier sheet. With the lever down, you can scan batches of photos or standard single- or multiple-page documents. On the right, there’s a cover open lever, the power button, a light that tells you if the scanner is ready, and a separate light to tell you if it has jammed. 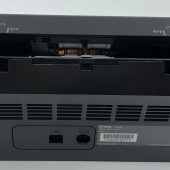 On the bottom right, there are buttons for stopping the scanner and starting the scanner. At the bottom of the scanner, there’s an extendable tray to catch your photos as they come out. 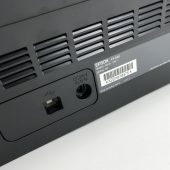 You’ll find a Kensington lock, the printer USB port, and the power port on the back of the scanner. 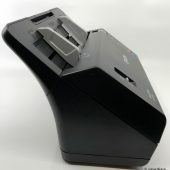 Once you have the scanner assembled (which takes less than 30 seconds), you’ll need to download its software here. 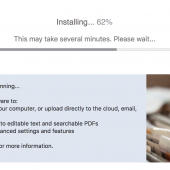 The system will determine which software you need to download for your operating system, and you’ll go through the typical installation process. 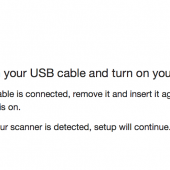 You can plug the scanner into power before downloading the software, but do not connect it to your computer yet.